OAV's Smart Panel Saw offers more than others. 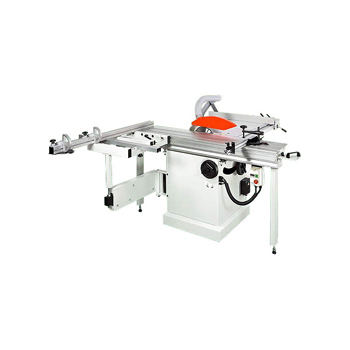 It is outstanding for its cutting quality, capacity and flexibility in everyday use. Where there is limited space and yet high quality requirements, OAV's Smart Panel Saw is ideal. Strong outrigger and large support roller for smooth panel loading. Miter fence for angle cutting. Precise alloy extruded rip fence with high/low profile. User-friendly scoring design for easy adjustment. Max. Sliding Stroke w / crosscut Fence 63" 1,600 mm. Max. Sliding Stroke w / o crosscut Fence 74-7/8" 1,900 mm. Table Size w/ext. wing 14-7/8" x 27" (40-1/8" x 47") W:377 mm. x D:688 mm. Main Saw Max Saw Blade Diameter 10" 254 mm. Cutting Height at 90, 45o 3-1/8"/2-1/8" 80/57 mm. Scoring saw Saw Blade Diameter 3/1/8" 80 mm. Saw Blade Arbor Dameter 7/8" 20 mm. Cutting Height at 90, 45o 3/16", 3/32" 5 mm., 3 mm. Ripping Width 33" 838 mm. Crosscut Width 54",92- 1/2" 1,380mm./ 2,350 mm. Due to needs of continuous improvement, specifications are subject to change without prior notice.